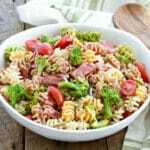 This is a light and tangy pasta salad filled with crisp broccoli, juicy tomatoes, and salty strips of salami; perfect for a weeknight dinner or a summer potluck. 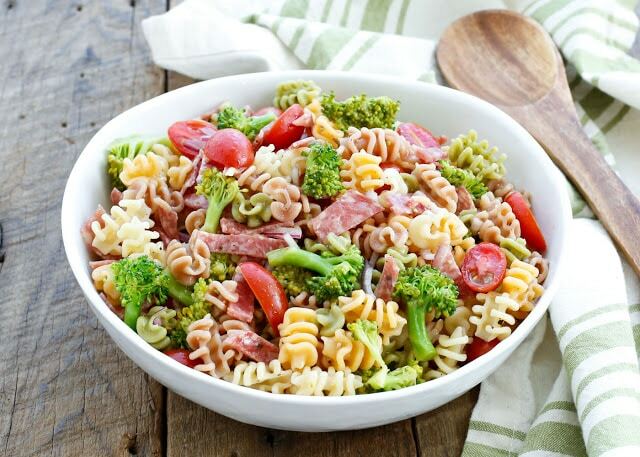 Broccoli is one of my favorite vegetables in a pasta salad. Those pretty little florets hold the dressing and carry so much flavor into each bite. My preference for pasta salads leans more toward a heaping mountain of vegetables with a bit of pasta mixed into it. My kids lean closer to a pile of cheesy pasta sans the vegetables. This salad is our compromise and it’s full of flavors that we all love. My boys adore salami and have been requesting it almost every time I’m headed to the grocery store. You can look forward to several more salami-centric recipes this summer. You can’t beat the convenience of a ready to use meat that requires no cooking in the heat of summer! Cook the pasta according to the manufacturer's directions. Drain in a colander and rinse well, until cool. 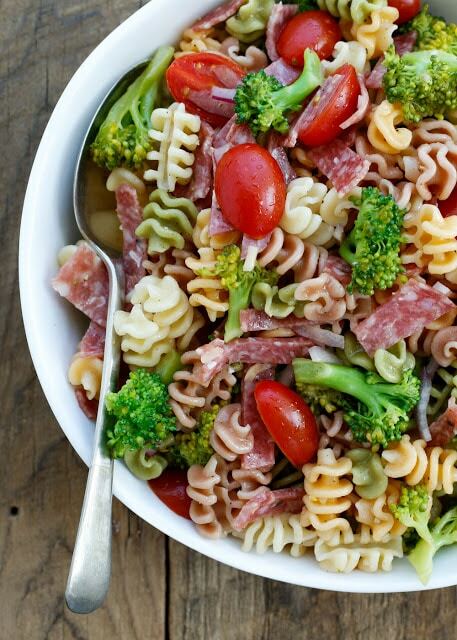 Combine the cooked pasta, broccoli, onion, tomatoes, and olives in a large mixing bowl. Drizzle with oil and vinegar and toss well to coat. Add the salami and toss again. Sprinkle with salt and pepper, toss again to mix thoroughly. Taste and add more salt, as needed. 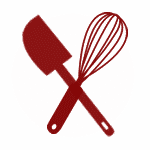 Serve immediately or refrigerate until ready to serve. This will keep nicely in the refrigerator for 2-3 days. Enjoy! I like to use a fairly small pasta for cold salad. I used a multi-colored vegetable radiatori for the salad pictured in the photos. A plain wheat or gluten free pasta works nicely as well. I adore olives in my pasta salads, but we are a house divided, so I left them off this time. If you enjoy olives, I highly recommend adding them. Just looking your pics, it is really tasty. I was asked by one of our amazing daughters-in-law if I had a good pasta salad recipe to make and bring to our granddaughter's 3rd birthday party...I did have a good recipe years ago but have lost track of it. I started my research and happily landed on your site. My husband, who before this recipe, said he did not like pasta salad, said it was delicious, and repeatedly said so during the day! This was my first experience with Gluten Free Pasta...I used Delallo Gluten Free Pasta Fusilli and it was perfect. The salad was so pretty, as well as a big hit taste-wise. I love that the deliciousness does not require a long list of ingredients, most of which I had on hand (including the Broccoli & Salami :-). This is a keeper...Thank you! I'm so very happy you like the recipe, Carol!